I finished this Shore Trooper back in December, but it seems fitting to write a post about it in the summer. After all, Rogue One enjoyed a nice tropical last third of the movie where these kind of troopers were all over the place. A couple thoughts about the Shore Trooper in general. This is by far my favorite new trooper design since Disney took over Star Wars. I love the use of color on the armor because it is something new but not new just to be different. It fits the look of the environment really well. The Shore Trooper is also somewhat reminiscent of the Scout Trooper from Return of the Jedi, which was one of my favorite OT designs. This kit was also my favorite of the Bandai trooper kits so far. The most fun came in painting and weathering this trooper. The box contains three options for the type of trooper you want to build. I decided on the highest ranking trooper, mostly because I liked the color scheme best. As usual, the decals provide the variety of color options, but I knew from past experience that many Bandai decals, especially on round areas like the shoulders, are difficult to work with. Because of this, I masked off the parts that needed the blue paint before I assembled the kit and painted them first. I used a mixture of Tamiya light blue with a little white. Then, a little toothpick work randomly around the paint gave it the chipped look. I did use the decals for the white stripe on the shoulder and the yellow stripe on the arm. After assembly, a couple of grey washes on the armor and sand on the brown pants highlighted the details. A little sand Tamiya weathering powder also gave the folds of the pants some highlighting. I also dirtied up the lower leg armor and boots a little more because of the likely heavy use in beach and brush environments. This is a really great kit, which I would buy more of to make different troopers, if I had endless supplies of money. This one will keep me satisfied though. Definitely grab this kit wherever you can find it! I keep coming back to these Bandai figure kits because they are just awesome. They are quick and make a great side project during a more prolonged or difficult model project. One of the fun things about the Clone Trooper kit was that there were so many options for how to paint and weather this guy. Stormtroopers are fairly uniform, but thanks to the Clone Wars TV series and even some brief glimpses in the prequels, clone troopers had a lot of different markings, not to mention they weathered a lot more and their armor showed it. When I first started assembling the clone trooper I was undecided about what sort of paint scheme I wanted to use, if any at all. Over the course of the build, I settled on the 212th Battalion color scheme because I have always loved Obi-Wan Kenobi and these were his troops on Utapau. I did a little googling to find a quality picture of the paint scheme and then jumped right in. Two regrets about the way I went about painting this kit, which will influence future projects. First, I had already assembled the trooper so I had to do some difficult masking in hard to access places, which could have been eased by masking before I assembled. Second, because I did not want to mask the entire trooper, I hand painted the spots that needed markings. Both of these regrets left me wishing I had masked and airbrushed all the markings before assembling the parts. Lesson learned for next time. Because I painted directly on the plastic, I was able to easily do some chipping with a toothpick and xacto knife. These gave a nice worn effect to the battalion markings. Then, to top the painting off, I did some panel line washing in a few spots and added some weathering pastels also. I finished the kit with a semi-gloss lacquer because the clone troopers were never quite as shiny as the stormtroopers. Overall, I am pretty proud of my first real customized paint job, notwithstanding the usual weathering effects. I really like the result, and if I had endless supplies of money (haha!) I would probably try to customize several different clone varieties. Lessons learned and a good-looking figure make a great success. As a bonus, you can switch out the heads to be either a Phase 1 or Phase 2 trooper. As you can see from the photos, I preferred the Phase 2. This is a great kit that will look even better when displayed next to my eventual Battle Droid and STAP kit. 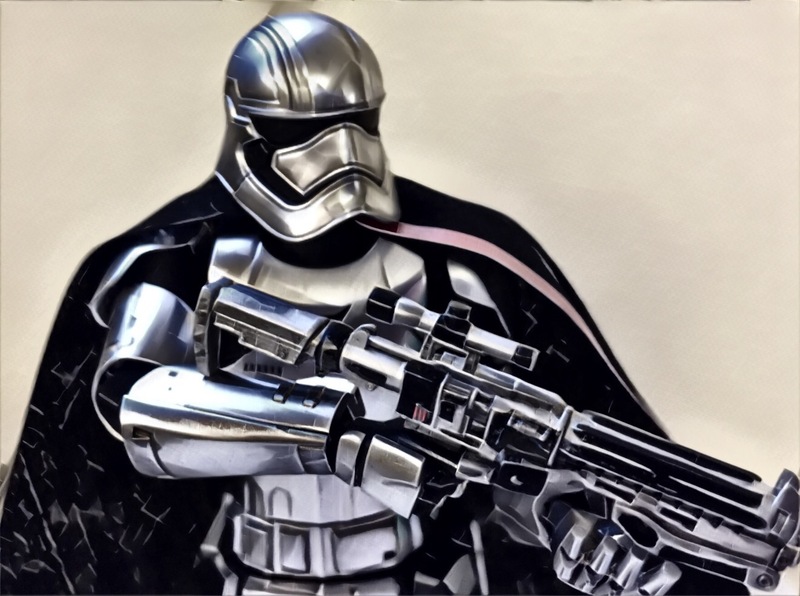 History may remember Captain Phasma as the cool-looking trooper who was a bit of a dud in her on-screen role (I’m still waiting for Episode 8 to change that), but hey, she is pretty darn good looking. This figure kit from Bandai is a good reminder of how great she looks. No problems with assembly. The parts fit just like all of the Bandai figure kits. The cape options were the only main downside. The box has either a hard plastic cape in two parts or a see-through fabric-y cape. I ultimately chose the fabric because I really did not like the rigidity of the plastic cape nor the two parts. I think there are other options out there for nicer fabric capes, but I don’t have the budget to buy another one when there are already two options in the box. I decided to take a bit of the chrome bite away by giving the whole kit a gloss varnish. This helped facilitate a little bit of wash weathering but still maintained a lot of the cool chrome look. Speaking of weathering, I did only a little. I did some panel line washing throughout the kit and gave her a few smudges here and there. I gave her blaster the most wash treatment. I really love this figure kit from Bandai. 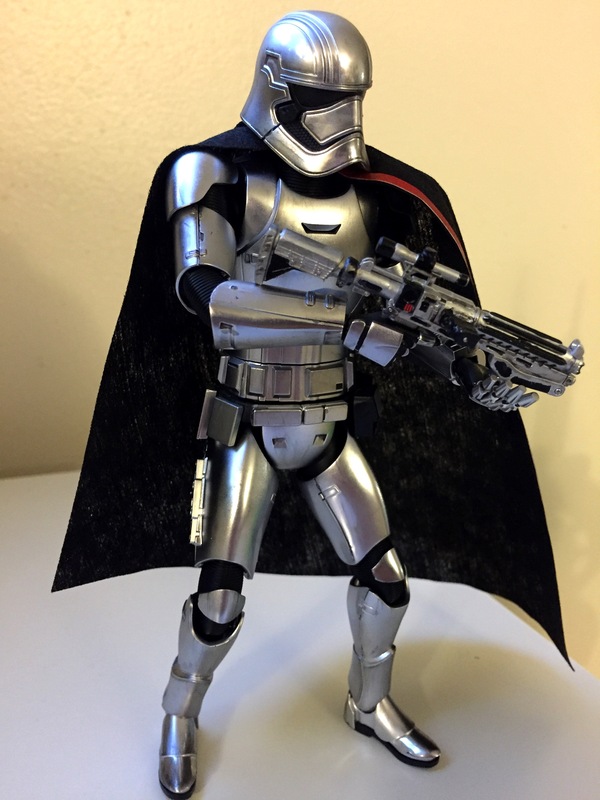 Cape issues aside, Phasma looks awesome and everything looks well-proportioned, scaled, and colored compared to some of the other options out there in the same scale. This Captain looks great up on my shelf next to her buddies Kylo Ren and the First Order Stormtrooper. I cannot wait to see how they might utilize her in the next movies, because when a character looks this awesome, she needs an awesome role. Everything is looking rather Imperial-y on my workbench, as I just recently finished Bandai’s First Order stormtrooper and have started on the First Order TIE. 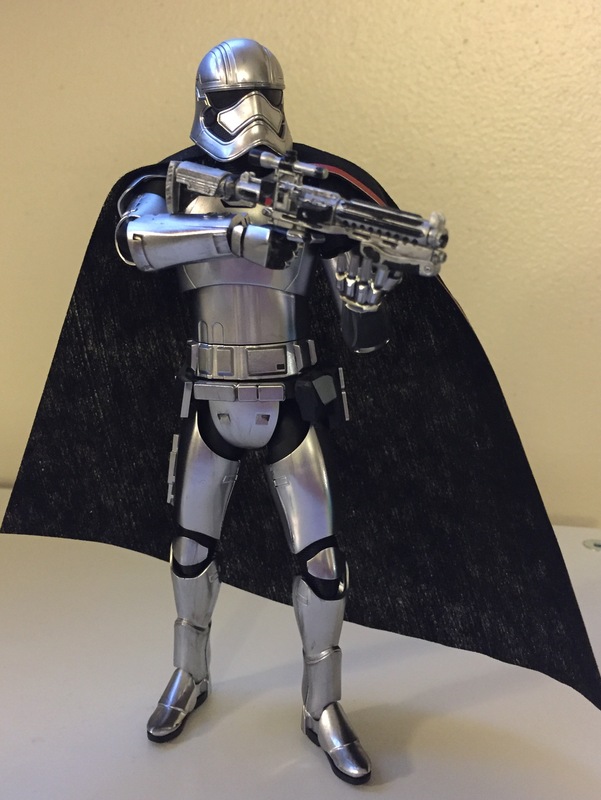 The First Order trooper looks great, as I expected. I did very little painting on the figure itself, just a couple coats of gloss and one dull so that he had a little shine but not too much. The troopers in the movies all have good looking armor, at least until they are blown up. Most of the paint work came on the accessories. All the hands needed white on the palms, which I never noticed while watching the movie. The weapon accessories all came molded in black, and the new blaster design is black, white, and silver. I found it easier to paint the whole thing white and then add in the black and silver highlights. The melee weapon was a similar story. I chose the now iconic TRAITOR!! 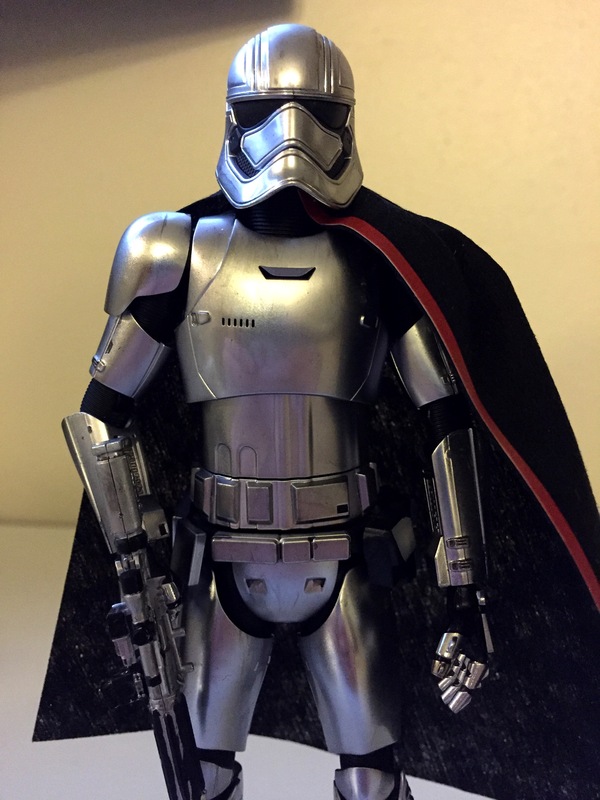 look for my trooper for now since it is so different from any trooper look we have seen before. He looks great, with the only minor complaint the blobby looking fist hand. Up next, the First Order TIE. Here is a little preview. I finally got around to finishing the 1/12 Sandtrooper kit from Bandai, and it looks great! The steps of the build were very similar to the standard stormtrooper kit, but the extra weapons, the pauldron, and the backpack added enough of a different touch to make the build a unique experience. -I used Pledge wax for a gloss finish over the decals and to give the base shiny trooper look. This is where I stopped with the standard trooper. -I did not want to over weather the armor because I thought that the Sandtroopers would still try to keep their armor as clean as possible in a harsh environment. I could not, however, resist giving this guy a dirty look so I used some weathering powders sparingly to give the appearance of dirt and sand. This gave just the right amount of wear that couldn’t be polished out no matter how hard he tried. -Finally, I finished the whole piece with a clear dull coat. This was my attempt to simulate years in an environment not conducive to anything looking good. Next time you hear from me, I will have pictures from a new workspace! We rearranged our whole basement to make room for a new baby in April, so my workbench moved. I should have some good updates on the Tri-Motor soon.